Hello again, Friends! Today we're going to show you how we created this intricate birthday card using the super fabulous inlaid die cutting technique. There are many different ways to achieve this technique which we'll demonstrate in future projects. However, sometimes this technique demands much more time especially when there are lots of tiny pieces to work with. So scroll down below to learn the know-how and tips that make the process whole lot easier and faster. 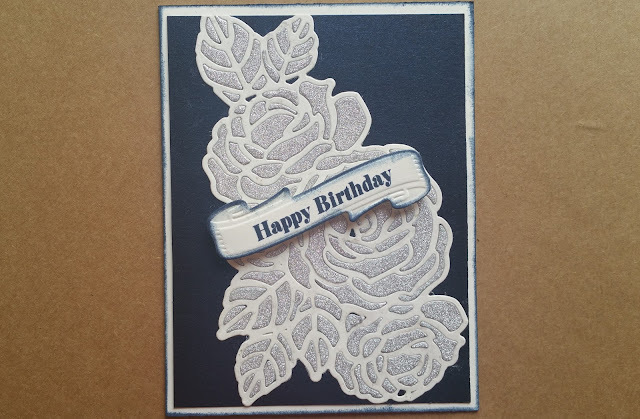 First, we cut the outline (positive) from white cardstock using blooming roses die cut and adhered it to a metallic cardstock. Next we took the leftover petals and leaves (negative) from our previous project and glued them piece by piece into the open space just like solving a puzzle. 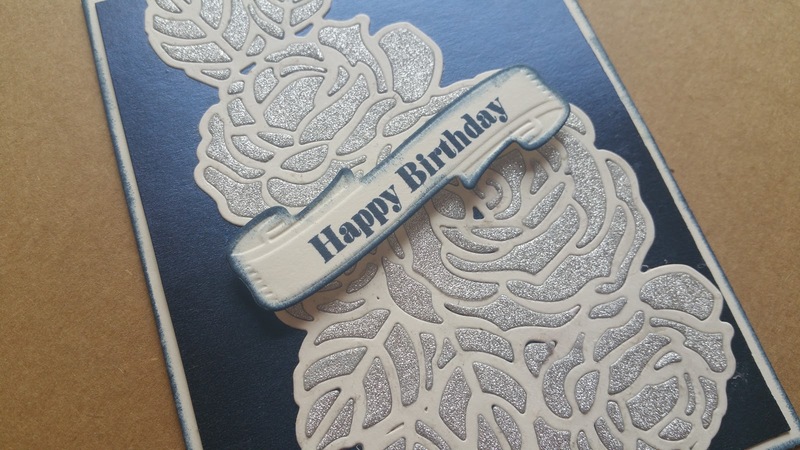 After gluing the metallic piece onto the center of the card base, we distressed the edges with outdoor denim ink. For the finishing touch we cut & embossed a label using one of the floral berry accents dies and stamped it with "Happy Birthday" sentiment from banner wishes stamp set. Finally we added a few foam pieces to give dimension to the accent. It takes hours to pick and glue each individual pieces in the right space of such an intricate die. So to save time it is best to work in sections. So once you have glued the outline to the metallic paper, cut the glitter paper but do not remove all the petals and leaves (negative). Apply glue to a small portion of open spaces within the outline and remove only the matching pieces from the die cut. Continue adhering the pieces in small sections until you are all done. This process seems lengthy but it savea a lot of time and effort. 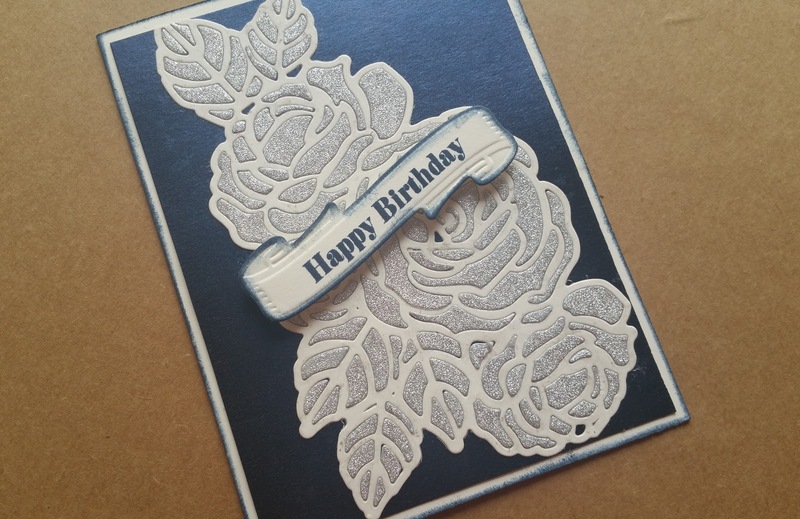 Want to create this card on your own? Purchase the DIY kit and learn how to create this card from the convenience of your home. 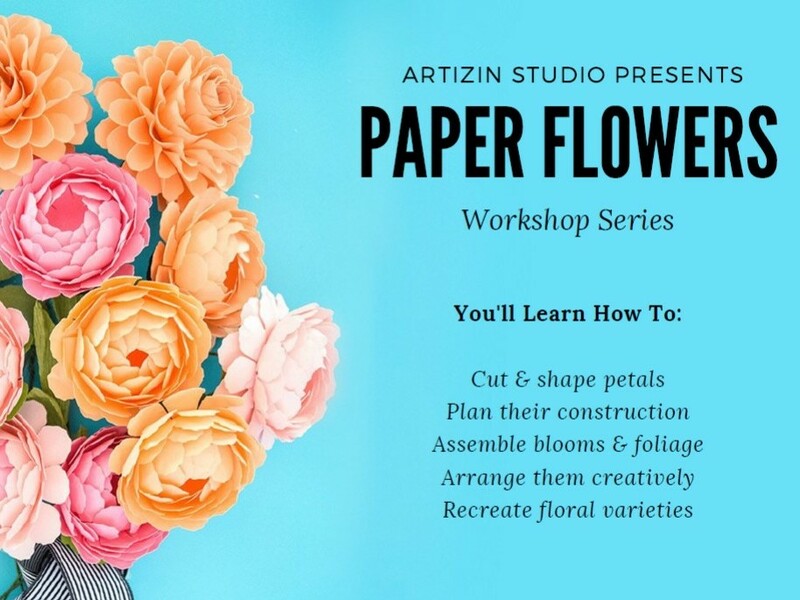 If you want to learn how to use the tools without having to invest in them and want to see live demonstration of this technique, book your spot and walk-into our studio by yourself or with your group of crafty friends! As usual, we have tons of DIY projects to share with you... and this is just one of them! We're always exploring new art forms, experimenting with latest tools and enjoying the process of creating and teaching!